With Mandela apparently on his deathbed, it's an appropriate time to take a look at this moving new picture book biography of the iconic South African figure by celebrated African-American author/illustrator Kadir Nelson. Nelson's magnificent paintings complement the poetic text, which begins by evoking Mandela's bucolic boyhood in the South African bush. At the tender age of 9, he was sent away to continue his schooling, the only one in his family to be chosen for Western formal schooling. His intellect was apparent even at an early age, and we see Nelson (a name given to him by British teachers) growing into a fine young man, a lawyer for those who couldn't defend themselves. Kadir Nelson describes the cruel policies of apartheid in simple terms suitable to a young audience, in a lyrical text that resembles free verse. The outlines of Mandela's life are all here--Mandela protesting with his fist raised in the air, Mandela tried and imprisoned, his people fighting for his release over the long years of jail, his triumphant return and election to president. 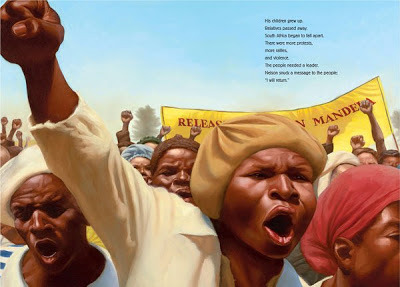 But as usual with Kadir Nelson's work, it is the illustrations which overwhelm us with their quiet power. Highly recommended for adults as well as children. 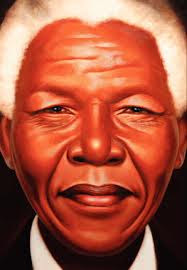 For more on Mandela for young people, check out his own picture book autobiography, Nelson Mandela: Long Walk to Freedom (Flash Point, 2009). For older children and adults, I would also recommend the abridged version of Mandela's own autobiography, Mandela: An Illustrated Autobiography (Little Brown, 1996), a fascinating and accessible version of his much longer autobiography published in 1994. A very timely choice. I may look into this picture book for my middle school library, since it's an easy way to get students to read nonfiction. Nelson's work is magnificent. Anxious to see this one. Thanks for the review! Nelson Madela's story is very empowering. Can't wait to find this one at the library. Thanks for the excellent pointers. Thanks for bringing this to my attention. It sounds wonderful and I will definitely look for it. Good to know about this picture book. I'm so impressed with Kadir Nelson. Will have to find this book for my kids! Thanks for sharing this in this month's themed round-up - I'd love to see this book.